The Metro Los Angeles Red Line opened in 1993 and stretched between Union Station and Westlake/MacArthur Park, with extensions westward and northbound opening in 1995 and 1999, respectively. Now connecting Union Station to North Hollywood, the Red Line - along with the Purple Line - collectively form L.A. Metro Rail's busiest line. Part One of this guide covers the Metro Red Line from North Hollywood station to Vermont/Beverly. Read on for Part Two of the guide, which includes Wilshire/Vermont to Union Station. The Westlake/MacArthur Park station is adorned with artwork by artists Francisco Letelier and Therman Statom, and Sonia Romero in themes that pay homage to the cultural history and future of the communities that are located in proximity to the station, which acts as a sort of urban oasis. 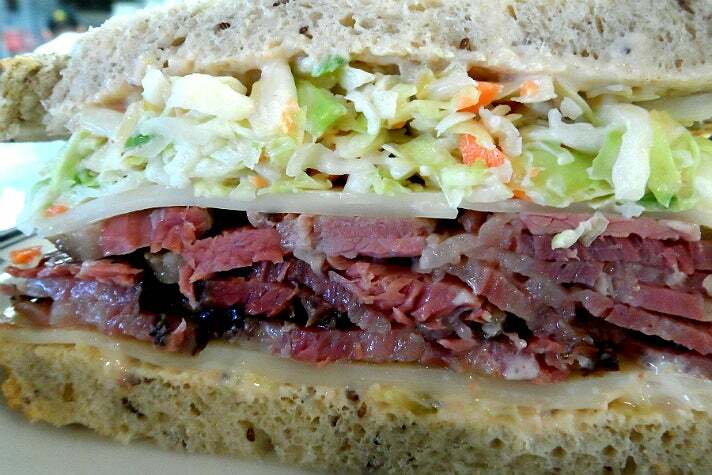 Points of interest include the vibrant scene at MacArthur Park and the James Beard Award-winning Langer's Delicatessen, which serves one of L.A.'s most iconic dishes, the Original #19 pastrami sandwich. Nearby accommodations include the Holiday Inn Express & Suites Los Angeles Downtown West and Ramada Los Angeles/Downtown West. Located at the intersection of 7th and Flower, the 7th Street/Metro Center/Julian Dixon station acts as the hub of multiple railway and bus lines, including the Blue, Expo, Red, Purple and Silver Lines. 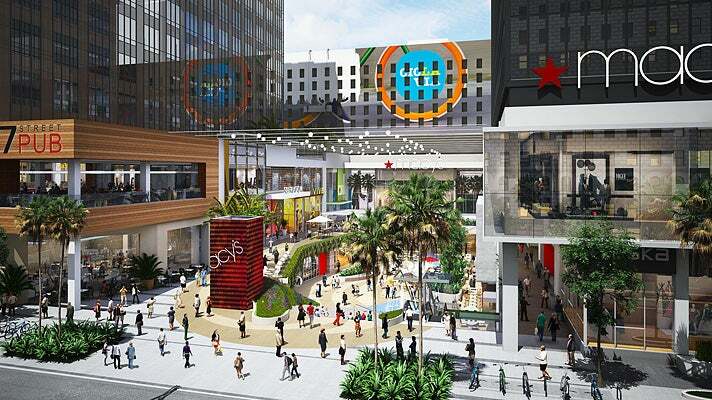 It has three underground levels, with the above-ground Macy's Plaza currently being transformed into a new shopping and entertainment destination called The Bloc. 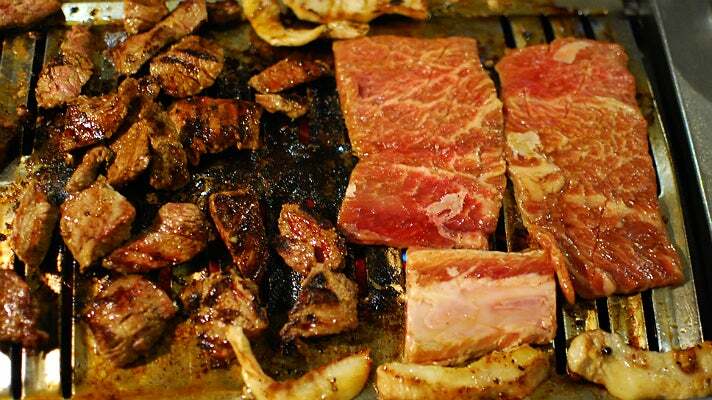 There are endless dining options within walking distance of the station, including B.S. Taqueria, Bottega Louie, Chaya Downtown, Drago Centro, Sugarfish, Faith & Flower, Fogo de Chao, and the bustling TASTE Food Hall at FIGat7th. Quench your thirst at bars like Seven Grand, City Tavern, Library Bar, Sixth Street Tavern, Casey's Irish Pub and the famed Rooftop at The Standard. Nearby accommodations include the Sheraton Downtown Los Angeles, The Standard Downtown L.A., Los Angeles Athletic Club, Westin Bonaventure and O Hotel. Artist Stephen Antonakos commemorates the first neon sign in the United States, posted just around the corner from the station in 1924, with his own hanging neon sculptures. Serving the Red, Purple, and Silver heavy rail lines, the Pershing Square station is convenient to Grand Central Market and the namesake Pershing Square, which was used as a camp by settlers from outside Pueblo de Los Angeles in the 1850s. In addition to Grand Central Market, nearby attractions include Los Angeles Center Theatre, Regent Theatre, The Last Bookstore and Clifton's Cafeteria. Dining spots include Nickel Diner, KazuNori, Guisados, Cole's, Water Grill and Josef Centeno's restaurants: Bar Amá, Bäco Mercat, Orsa & Winston and Ledlow. Drink options include Perch, La Cita, Beelman's Pub, Spring St. Bar, The Varnish and Las Perlas. 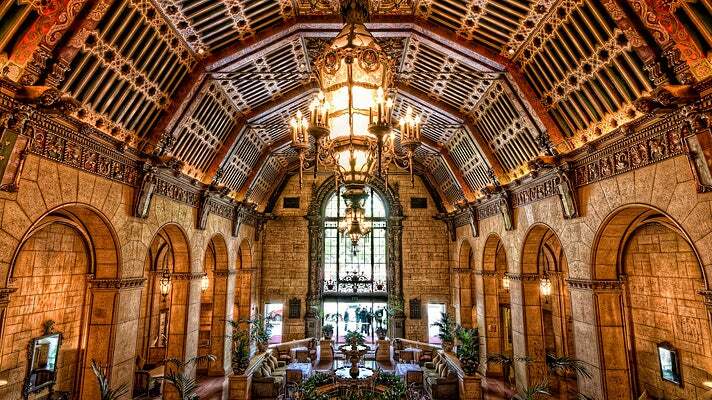 Accommodations near Pershing Square include the Millennium Biltmore and Hilton Checkers Los Angeles. Named after former L.A. mayor Tom Bradley, a strong proponent of the Metro railway system, the Civic Center/Grand Park station services the Red and Purple Lines underground and the Silver Line at street level. You'll find artist Jonathan Borofsky's six figures, entitled "I Dreamed I Could Fly" and resembling the artist, above with accompanying soundbites of birds. 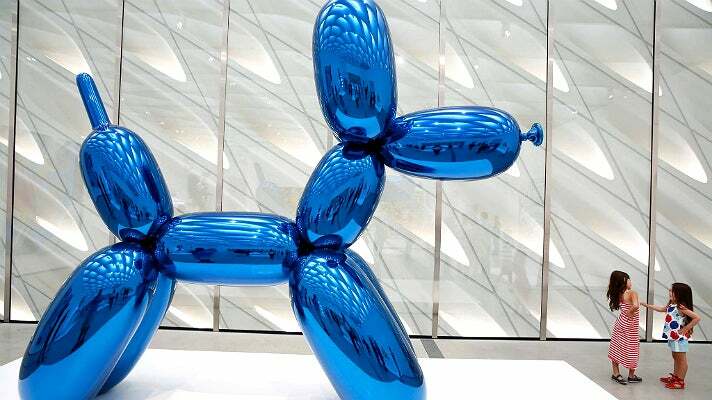 It's no coincidence the station is named "Civic Center" - you'll take this station for Walt Disney Concert Hall, Dorothy Chandler Pavilion, Ahmanson Theatre, Mark Taper Forum, The Broad, Museum of Contemporary Art (MOCA) and Los Angeles City Hall. Nearby restaurants include Otium, Kendall's Brasserie, Cafe Pinot, Patina, Redbird and numerous options in Little Tokyo. For nightlife, there's The Edison, Far Bar, Wolf & Crane and Redwood Bar & Grill. Area hotels include the Doubletree by Hilton Los Angeles Downtown and the Miyako Hotel. 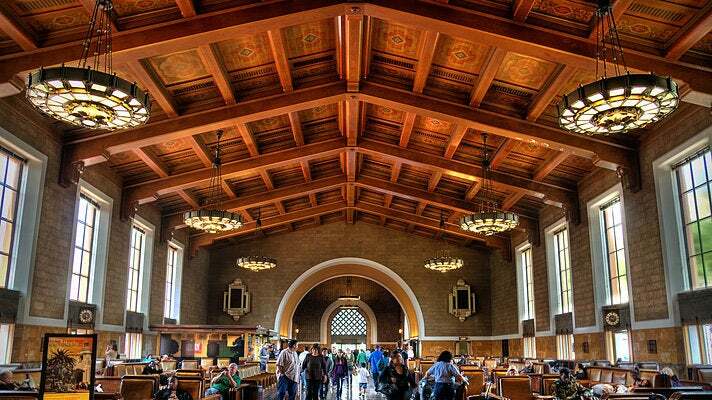 The hub of the entire Metro Los Angeles system lies at Union Station, the largest railroad passenger terminal in the Western United States. It opened in 1939 and replaced two previous iterations and controversially consolidated the services of a number of railroads into one terminal station. It was placed on the National Register of Historic Places in 1980. 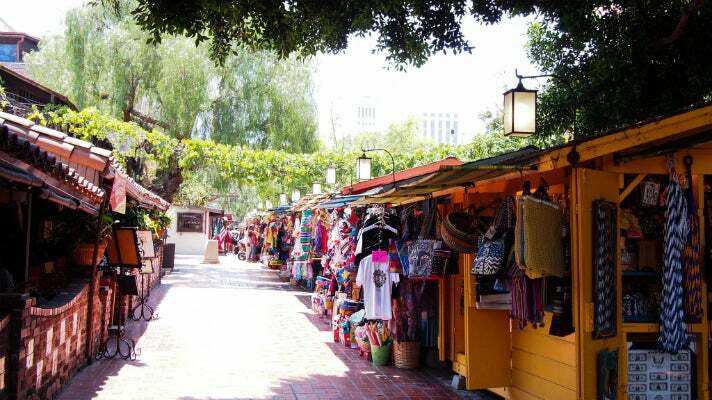 From this station, you can reach the Greyhound bus station, El Pueblo de Los Angeles Historical Monument, Pico House, and Olvera Street - the colorful Mexican marketplace is the site of several of L.A.'s most historic buildings, along with dozens of craft shops, restaurants and other businesses.